← When Do We Need To Register For VAT? Surprisingly, there are no ‘standard’ or recognised methods of calculating these allowable expenses. In the ‘good old days’, accountants would simply claim a global ‘round sum’ amount (often about £20 – £30 per month) to cover these costs, which was never challenged by HMRC, as it was not significant or worth amending. However, in 2004, the limit of these round sum amounts was capped at £2 per week (or £104 per year). Anything above this rate was increasingly likely to trigger an investigation. In 2009 though, this was increased to £3 a week, and, from April 2012, it was increased, again, to (wait for it) a massive £4 per week. If we feel that the £4 is insufficient (and who wouldn’t) we can claim specific costs, based on actual expenditure, provided we can support our claim. · Expenses must be ‘wholly and exclusively’ for the business. If mixed usage (part business, part personal) the business part must be separately identifiable. · Where an area of the house is used partly for business, and partly for personal, the expenses will be apportioned by time used, as well as floor area utilised. As a general rule, we tend to apportion all of the above costs on the basis of floor area utilised. In reality, this may be difficult to calculate, so it is perfectly acceptable to work on the basis of numbers of rooms in the house. If, for example, we use one room for business purposes, and there are four further rooms, the business element will be 1/5, or 20% of the total running costs of the home. If we further estimate that this room is used 50% for business, and 50% personal, the percentage claimed will be halved to 10%. · Telephone (including line rental) apportioned by call time (incoming and outgoing). A dedicated business line can be claimed in full. · Capital allowances (wear and tear) on business equipment. 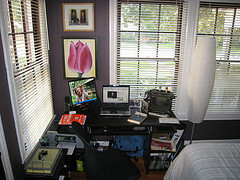 (including computers and peripherals, office furniture and fixtures such as shelving etc). Annual Investment Allowance currently means that we can claim 100% of the cost in the first year, up to a capital cost of £25,000, increasing (subject to legislation) temporarily to £250,000. · Travelling and subsistence costs (a whole topic in its own right). Subsistence relates to the ourselves only. Any entertaining of suppliers, business associates and, even, customers is totally disallowable. · Most mortgage companies ask us to stipulate whether or not there is a business element to our occupation. We may need to be able to prove to them that we have separate business insurance to cover us for this. · Running a business from home may attract the attention of the Valuation Office Agency who will determine whether or not a property will attract business rates. Guidelines for this can be found at:http://www.voa.gov.uk/corporate/Publications/workingFromHome.html. One major concern in the past has been that, if we claimed an area of our home as primarily for business use, then, on sale, this element of the property would not be eligible for Principle Private Residence Relief, which could, potentially give rise to a Capital Gains Tax liability. In June 2008, however, HMRC announced that this would no longer apply, so, for now, we are no longer subject to any CGT on the sale of our house, One thing to be aware of here, though, is that, if you are running a substantial business from home, and the VOA determine that all, or part, of your house should be subject to business rates, then you may still be subject to CGT on that proportion of the home. Legislation is constantly being updated, and the only piece of advice that never changes is; Always check with your accountant, when looking to claim or calculate these expenses. (Advice the odd MP would have done well to heed recently). This entry was posted in Business and tagged Business, Expense, HM Revenue & Customs, Home working, Valuation Office Agency. Bookmark the permalink.